One of the most important phases of emergency care is to clear the upper respiratory passage of any obstruction. If the fractured jaw interferes with breathing, pull the lower jaw and the tongue well forward and keep them in that position. Apply a four-tailed bandage, as shown in figure 4-41. Be sure that the bandage pulls the lower jaw forward. Never apply a bandage that forces the jaw backward, since this might seriously interfere with breathing. 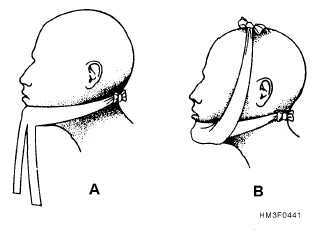 The bandage must be firm so that it will support and immobilize the injured jaw, but it must not press against the victims throat. Be sure that the victim has scissors or a knife to cut the bandage in case of vomiting. Treat the victim for shock and evacuate as soon as possible. Skull Fracture When a person suffers a head injury, the greatest danger is that the brain may be severely damaged; whether or not the skull is fractured is a matter of secondary importance. In some cases, injuries that fracture the skull do not cause serious brain damage; but brain damage canand frequently doesresult from apparently slight injuries that do not cause damage to the skull itself. It is often difficult to determine whether an injury has affected the brain because the symptoms of brain damage vary greatly. A person suffering from a head injury must be handled very carefully and given immediate medical attention. Some of the symptoms that may indicate brain damage are listed below. However, you must remember that all of these symptoms are not always present in any one case and that the symptoms that do occur may be greatly delayed. Bruises or wounds of the scalp may indicate that the victim has sustained a blow to the head. Sometimes the skull is depressed (caved in) at the point of impact. If the fracture is open, you may find glass, shrapnel, or other objects penetrating the skull. The victim may be conscious or unconscious. If conscious, the victim may feel dizzy and weak, as though about to faint. Severe headache sometimes (but not always) accompanies head injuries. The pupils of the eyes may be unequal in size and may not react normally to light. There may be bleeding from the ears, nose, or mouth. The victim may vomit. The victim may be restless and perhaps confused and disoriented. The arms, legs, face, or other parts of the body may be partially paralyzed. The victims face may be very pale, or it may be unusually flushed. The victim is likely to be suffering from shock, but the symptoms of shock may be disguised by other symptoms. It is not necessary to determine if the skull is fractured when you are giving first aid to a person who has suffered a head injury. The treatment is the same in either case, and the primary intent is to prevent further damage to the brain. Keep the victim lying down. If the face is flushed, raise the head and shoulders slightly. If the face is pale, have the victim lie so that the head is level with, or slightly lower than, the body. Watch carefully for vomiting. If the victim begins to vomit, position the head to prevent choking on the vomitus. If there is serious bleeding from the wounds, try to control that bleeding by the application of direct pressure, using caution to avoid further injury to the skull or brain. Use a donut-shaped bandage to gently surround protruding objects. Never manipulate those objects. Be very careful about moving or handling the victim. Move the victim no more than is 4-51 Figure 4-41.Four-tailed bandage for the jaw.